The MDT-4AB five-channel model is for remote control of up to five separate access points or for combining keyless entry and panic functions. It is also for use as a “magic wand” transmitter by personnel responsible for maintenance of a Linear access control system. 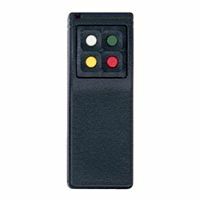 It allows the user to lock gate A or B open or closed (remotely from a vehicle or office), then to perform a reset or “warn boot” on the system.